The W4G Series 4G LTE Cellular Option can be added to our CPM Series Console Server + Switched PDU Combos to provide secure cellular access to CPM units at distant network equipment sites. 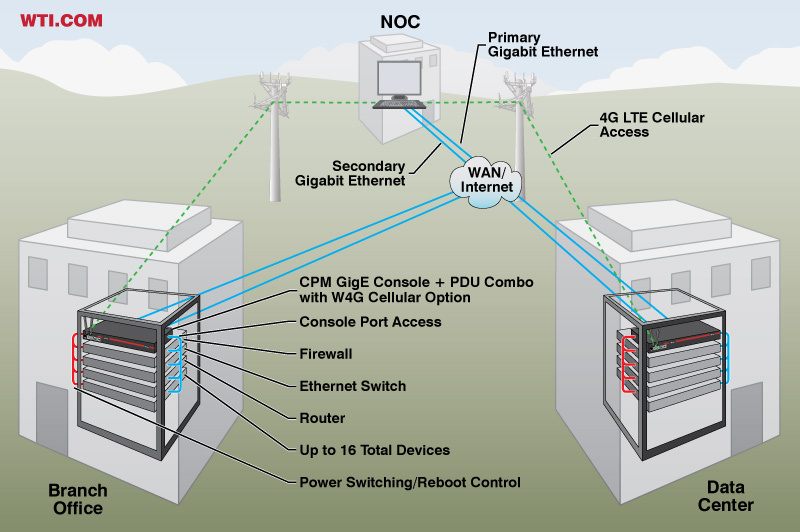 When the W4G Cellular Option is added to a CPM Console + PDU Combo, network administrators can access console port command functions and control power rebot switching for critical network elements at remote sites via cellular. This provides an effective, economical alternative for managing distant network devices, especially in cases where the remote, inaccessible nature of the site makes access via network cable or phone line impractical. W4G-ATT-CPM8 CPM-800 Series AT&T 4G LTE (2) LTE ATT 1 dBi 7.5"
W4G-ATT-CPM16 CPM-1600 Series AT&T 4G LTE (2) LTE ATT 1 dBi 7.5"
W4G-VZW-CPM8 CPM-800 Series Verizon 4G LTE (2) LTE VZW/EU 3.5 dBi 7"
W4G-VZW-CPM16 CPM-1600 Series Verizon 4G LTE (2) LTE VZW/EU 3.5 dBi 7"
W4G-EUA-CPM8 CPM-800 Series World 4G LTE (2) LTE VZW/EU 3.5 dBi 7"
W4G-EUA-CPM16 CPM-1600 Series World 4G LTE (2) LTE VZW/EU 3.5 dBi 7"
Secure Access to Remote Console Ports and Reboot Functions via Cellular! The ability to securely access console ports and power reboot functions at remote network equipment sites provides a crucial tool for dealing with network emergencies. Once connected to a console port or switched PDU, support personnel can tweak configuration parameters or initiate a power reboot cycle in order to revive unresponsive devices and restore network communication. Although access to console ports and power reboot control is generally a simple proposition in applications where network equipment is located close at hand, the task of managing vital network elements at remote locations can present major challenges when dealing with inaccessible locations where a network cable or dial-up phone line is not a practical option. The W4G Series Cellular Modem Option for WTI's CPM Series Console Servers + Switched PDU Combos simplifies management of network elements at remote installation sites by providing IT professionals with secure, cellular access to console port commands and power reboot functions. Even when normal network communication is down, support personnel can still establish a secure connection to the CPM via cellular and instantly gain access to configuration, troubleshooting and power switching capabilities, allowing rapid resolution of network issues at remote sites, without the hassles, delays and expense of a physical sevice call.